So, maybe I should have listened to my husband when he said to just buy some cupcakes for the kid's school parties and be done with it, but don't tell him that. (mistake number one) I was determined to make something original. I waited until the last minute to decide what I wanted to do (mistake number two) and then came up empty on almost every ingredient needed. By the way, Wal-Mart and Target do not carry Nutter Butters- just in case you were wondering. 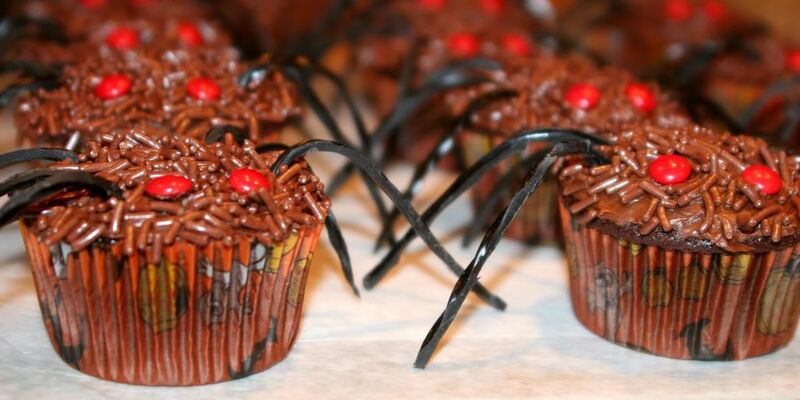 I was going to do witches with the Nutter Butters, but couldn't find the wafer cookies or the thin candy bars, so ended up doing the spider cupcakes. I would have done the ghosts tonight, but didn't have any white chocolate on hand. (mistake number three) The spiders turned out more like turantulas because I couldn't find the pull and peel black licorice anywhere. Haldan was a great helper today while I was at work and stopped at several places to try and find them. When I got home I must have called at least a dozen other places only to realize they were no where to be found, so I bought the regular thick licorice (mistake number four) which proved to be much more time consuming and annoying than (I'm sure) it's worth. I think I actually got a blister on my finger from cutting, if you can believe that. I had to cut them in sixths lengthwise (to make 300 legs). It tested my patience on many levels. I ended up making 50 of these puppies. And yes I realize spiders have 8 legs, but as it was I just had enough to do 50. Haldan actually helped me when he got home from work tonight even though he was against it from the beginning... I owe him big time. It's 12:30 and I have to get up early to try to figure out what to do to Pokey's hair for crazy hair day. I had this totally different idea in my head, but isn't that how things usually go? They were much cuter on the bakerella.com website, but I think they turned out ok. Hope the kids like them. In other news, it was a nasty day here today. It poured buckets! They say we have had a record amount of rain for the month of October... and I was out in it all day long running errands for work wishing I could still be in New Mexico (where today it's 70 and sunny). I think they look super cute! Wish I had the ingredients to do something fun like that! :) That's so nice to have your hubbys help even though he wasn't on board with it! :) Maybe it'll dry out by tomorrow? I'm sorry sounds like it wasn't your day today. The cupcakes are cute. We are making some similar spider ones for zoies class halloween party today. I'm surprised you can make treats for the class the schools out here don't allow homemade treats store bought only. Can't wait to see the kids halloween costumes :D Hope the sun comes out your way soon!! those turned out super cute! way to be persistant! no rain for sat! SUPER CUTE! All that work just for them to be devoured. I hope this rain stops before it's time for it to snow. Alica... kudos on a job well done. Tell Haldan he's the best (okay, actually, I think my honey's the best, but hopefully he'll understand). You certainly know how to make simple things beautiful. Way to go.